For other uses, see Winter of Discontent (disambiguation). The Winter of Discontent was the winter of 1978–79 in the United Kingdom, during which there were widespread strikes by public sector trade unions demanding larger pay rises, following the ongoing pay caps of the Labour Party government led by James Callaghan against Trades Union Congress opposition to control inflation, during the coldest winter for 16 years. The strikes were a result of the Labour government's attempt to control inflation by a forced departure from their social contract with the unions by imposing rules on the public sector that pay rises be kept below 5%, to control inflation in itself and as an example to the private sector. However, some employees' unions conducted their negotiations within mutually agreed limits above this limit with employers. 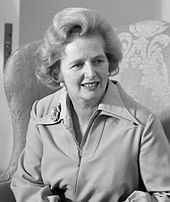 While the strikes were largely over by February 1979, the government's inability to contain the strikes earlier helped lead to Margaret Thatcher's Conservative victory in the 1979 general election and legislation to restrict unions. Public sector employee strike actions included an unofficial strike by gravediggers working in Liverpool and Tameside, and strikes by refuse collectors. Additionally, NHS ancillary workers formed picket lines to blockade hospital entrances with the result that many hospitals were reduced to taking emergency patients only. The phrase "Winter of Discontent" is from the opening line of William Shakespeare's Richard III: "Now is the winter of our discontent / Made glorious summer by this sun [or son] of York", and was first applied to the events of the winter by Robin Chater, a writer at Incomes Data Report. It was subsequently used in a speech by James Callaghan and translated to define a crisis by tabloids – including The Sun. The weather turned very cold in the early months of 1979 with blizzards and deep snow, the coldest since 1962–63, rendering some jobs impossible, reducing retail spending and worsening the economy. In 1969, Labour politician James Callaghan led a cabinet revolt which led to the abandonment of a proposed reform of trade union law outlined in a Barbara Castle white paper called In Place of Strife; had Castle's white paper been implemented, most of the action during the Winter of Discontent would have been illegal. Britain's economy during the 1970s was so weak that Callaghan warned his fellow Cabinet members in 1974 of the possibility of "a breakdown of democracy", telling them that "If I were a young man, I would emigrate." The Labour governments of Harold Wilson and Callaghan continued a fight begun in 1972 against inflation upon election in February 1974. Inflation had peaked at 26.9% in the 12 months to August 1975, but while demonstrating to markets fiscal responsibility they wished to avoid large increases in unemployment. As part of the campaign to bring down inflation, the government had agreed a "social contract" with the Trades Union Congress which allowed for a voluntary incomes policy in which the pay rises for workers were held down to limits set by the government. Previous governments had brought in incomes policies backed by Acts of Parliament, but the social contract agreed that this would not happen. Phase I of the pay policy was announced on 11 July 1975 with a white paper entitled The Attack on Inflation. This proposed a limit on wage rises of £6 per week for all earning below £8,500 annually. The TUC General Council had accepted these proposals by 19 votes to 13. On 5 May 1976 the TUC accepted a new policy for 1976 increases, beginning 1 August, of between £2.50 and £4 per week with further years outlined. At the Annual Congress on 8 September 1976 the TUC rejected a motion which called for a return to free collective bargaining (which meant no incomes policy at all) once Phase I expired on 1 August 1977. This new policy was Phase II of the incomes policy. On 15 July 1977, the Chancellor of the Exchequer Denis Healey announced Phase III of the incomes policy in which there was to be a phased return to free collective bargaining, without "a free-for-all". After prolonged negotiations, the TUC agreed to continue with the modest increases recommended for 1977–78 under Phase II limits and not to try to reopen pay agreements made under the previous policy, while the Government agreed not to intervene in pay negotiations. The Conservative Party criticised the power of the unions and lack of any stronger policy to cover the period from the summer of 1978. The inflation rate continued to fall through 1977 and by 1978 the annual rate fell below 10%. Having prepared for the imminent end of the incomes policy, global inflation supervened and was coming towards record levels during the 1978–82 period[n 1] on 21 July 1978 Denis Healey introduced a new White Paper which set a guideline for pay rises of 5% in the year from 1 August. [n 2] The TUC voted overwhelmingly on 26 July to reject the limit and insist on a return to free collective bargaining as they were promised. Unexpectedly, on 7 September, Prime Minister James Callaghan announced that he would not be calling a general election that autumn but seeking to go through the winter with continued pay restraint so that the economy would be in a better state in preparation for a spring election. The pay limit was officially termed "Phase IV" but most referred to it as "the 5% limit". Although the government did not make the 5% limit a legal requirement, it decided to impose penalties on private and public government contractors who broke the limit. Although not an official guideline, the pay rise set by Ford of Britain was accepted throughout private industry as a benchmark for negotiations. Ford had enjoyed a good year, and could afford to offer a large pay rise to its workers. The company was, however, also a major government contractor. Ford's management therefore made a pay offer within the 5% guidelines. In response, 15,000 Ford workers, mostly from the Transport and General Workers Union (TGWU), began an unofficial strike on 22 September 1978, which subsequently became an official TGWU action on 5 October. The number of participants grew to 57,000. During the strike, Vauxhall Motors employees accepted an 8.5% rise. After long negotiation in which they weighed the chances of suffering from government sanctions against the continued damage of the strike, Ford eventually revised their offer to 17% and decided to accept the sanctions; Ford workers accepted the rise on 22 November. As the Ford strike was starting, the Labour Party conference began at Blackpool. Terry Duffy, the delegate from Liverpool Wavertree Constituency Labour Party and a supporter of the Militant group, moved a motion on 2 October which demanded "that the Government immediately cease intervening in wage negotiations". Despite a plea from Michael Foot not to put the motion to the vote, the resolution was carried by 4,017,000 to 1,924,000. The next day, the Prime Minister accepted the fact of defeat by saying "I think it was a lesson in democracy yesterday", but insisted that he would not let up on the fight against inflation. Meanwhile, the government's situation in the House of Commons was increasingly difficult; through by-elections it had lost its majority of 3 in 1976 and had been forced to put together a pact with the Liberal Party in 1977 in order to keep winning votes on legislation; the pact lapsed in July 1978. A decision to grant extra Parliamentary seats to Northern Ireland afforded temporary support from the Ulster Unionist Party, but the Unionists were clear that this support would be withdrawn immediately after the Bill to grant extra seats had been passed – it was through the Ulster Unionists agreeing to abstain that the government defeated a motion of no confidence by 312 to 300 on 9 November. By the middle of November it was clear that Ford would offer an increase substantially over the 5% limit. The government subsequently entered into intense negotiations with the TUC, hoping to produce an agreement on pay policy that would prevent disputes and show political unity in the run-up to the general election. A limited and weak formula was eventually worked out and put to the General Council of the TUC on 14 November, but its General Council vote was tied 14–14, with the formula being rejected on the Chair's casting vote. One important personality on the TUC General Council had changed earlier in 1978 with Moss Evans replacing Jack Jones at the TGWU. Evans proved a weak leader of his union, although it is doubtful whether Jones could have restrained the actions of some of the TGWU shop stewards. After Ford settled, the government announced on 28 November that sanctions[clarification needed] would be imposed on Ford, along with 220 other companies, for breach of the pay policy. The announcement of actual sanctions produced an immediate protest from the Confederation of British Industry which announced that it would challenge their legality. The Conservatives put down a motion in the House of Commons to revoke the sanctions. A co-ordinated protest by left-wing Labour MPs over spending on defence forced the debate set for 7 December to be postponed; however on 13 December an anti-sanctions amendment was passed by 285 to 279. The substantive motion as amended was then passed by 285 to 283. James Callaghan put down a further motion of confidence for the next day, which the government won by 10 votes (300 to 290), but accepted that his government could not use sanctions. In effect this deprived the government of any means of enforcing the 5% limit on private industry. With the government having no way of enforcing its pay policy, unions which had not yet put in pay claims began to increase their aim. The first to take extreme action were lorry drivers, members of the TGWU. Large numbers of the lorry drivers worked on oil tankers, and drivers working for BP and Esso began an overtime ban in support of rises of up to 40% on 18 December. With supplies of oil being disrupted, the Cabinet Office prepared "Operation Drumstick", by which the Army were put on standby to take over from the tanker drivers. However, the Operation would need the declaration of a state of emergency in order to allow conscription of the assets of the oil companies, and the government drew back from such a step. Before the situation developed into a crisis the oil companies settled on wage rises of around 15%. From 3 January 1979 an unofficial strike of all TGWU lorry drivers began. With petrol distribution held up, petrol stations closed across the country. The strikers also picketed the main ports. The strikes were made official on 11 January by the TGWU and 12 January by the United Road Transport Union. With 80% of the nation's goods transported by road, essential supplies were put in danger as striking drivers picketed those firms that continued to work. While the oil tanker drivers were working, the main refineries were also targeted and the tanker drivers let the strikers know where they were going, allowing for flying pickets to turn them back at their destination. More than 1,000,000 UK workers were laid off temporarily during the disputes. A further plan was drawn up to call a state of emergency and safeguard essential supplies through the Army, regarding which the government warned the TGWU leadership, which resulted in the union accepting (12 January 1979) a list of emergency supplies which were officially exempt from action. In practice, what counted as an emergency was left up to local officials of the TGWU to determine, and practice across the country varied according to the views of the local shop stewards who established "dispensation committees" to decide. When strikers in Hull did not allow the correct mix of animal feed through to local farms, the farmers dropped the bodies of dead piglets and chickens outside the union offices; the union contended that the farmer had actually wrung the chicken's necks to kill them, and the piglets had been killed when the sow rolled over and crushed them. On 29 January, lorry drivers in the south west accepted a deal awarded by an Arbitration Panel of a rise of up to 20%, just £1 per week less than the union had been striking for; this settlement proved a model which was accepted throughout the country. Well, that's a judgment that you are making. I promise you that if you look at it from outside, and perhaps you're taking rather a parochial view at the moment, I don't think that other people in the world would share the view that there is mounting chaos. The next day's edition of The Sun featured the famous headline "Crisis? What crisis?" with a subheading "Rail, lorry, jobs chaos – and Jim blames Press", condemning Callaghan as being "out of touch" with British society. 22 January 1979 was the biggest individual day of strike action since the General Strike of 1926, and many workers stayed out indefinitely afterwards. With many in the private sector having achieved substantial rises, the public sector unions became increasingly concerned to keep pace in terms of pay. The government had already announced a slight weakening of the policy on 16 January, which gave the unions cause for hope that they might win and use free collective bargaining. Train drivers belonging to ASLEF and the National Union of Railwaymen had already begun a series of 24-hour strikes, and the Royal College of Nursing conference on 18 January decided to ask that the pay of nurses be increased to the same level in real terms as 1974, which would mean a 25% average rise. The public sector unions labelled the date the "Day of Action", in which they held a 24-hour strike and marched to demand a £60 per week minimum wage. With the succession of strikes having been called and then won, many groups of workers began to take unofficial action – often without the consent or support of the union leaderships. Ambulance drivers began to take strike action in mid-January, and in parts of the country (London, West Midlands, Cardiff, Glasgow and the west of Scotland) their action included refusing to attend 999 emergency calls. In these areas, the Army was drafted in to provide a skeleton service. Ancillary hospital staff also went on strike. On 30 January, the Secretary of State for Social Services David Ennals announced that 1,100 of 2,300 NHS hospitals were only treating emergencies, that practically no ambulance service was operating normally, and that the ancillary health service workers were deciding which cases merited treatment. The media reported with scorn that cancer patients were being prevented from getting essential treatment. A notorious industrial action during the winter, and one which was later frequently referred to by Conservative politicians, was the strike by gravediggers, members of the GMWU in Liverpool and in Tameside near Manchester. Eighty gravediggers being on strike, Liverpool City Council hired a factory in Speke to store the corpses until they could be buried. The Department of Environment noted that there were 150 bodies stored at the factory at one point, with 25 more added every day. The reports of unburied bodies caused concern with the public. On 1 February a persistent journalist asked the Medical Officer of Health for Liverpool, Dr Duncan Bolton, what would be done if the strike continued for months, Bolton speculated that burial at sea would be considered. Although his response was hypothetical, in the circumstances it caused great alarm. Other alternatives were considered, including allowing the bereaved to dig their own funeral's graves, deploying troops, and engaging private contractors to inter the bodies. The main concerns were said to be aesthetic because bodies could be safely stored in heat-sealed bags for up to six weeks. Bolton later reported being "horrified" by the sensationalised reportage of the strike in the mass media. The gravediggers eventually settled for a 14% rise after a fortnight's strike. With many collectors having been on strike since 22 January, local authorities began to run out of space for storing waste and used local parks under their control. The Conservative controlled Westminster City Council used Leicester Square in the heart of London's West End for piles of rubbish and, as the Evening Standard reported, this attracted rats. On 21 February, a settlement of the local authority workers' dispute was agreed, whereby workers got an 11% rise, plus £1 per week, with the possibility of extra rises, should a pay comparability study recommend them. Some left-wing local authorities, among them the London Borough of Camden, conceded the union demands in full (known as the "Camden surplus") and then saw an investigation by the District Auditor, which eventually ruled it a breach of fiduciary duty[n 3] and therefore illegal. Camden Borough councillors, among them Ken Livingstone, avoided surcharge. Livingstone was Leader of the Greater London Council at the time the decision not to impose a surcharge was made. Prior to the "Winter of Discontent", the Callaghan government had sought (in 1976) an International Monetary Fund loan of £2.3bn to combat the rampant inflation at that time. Although the media reported this as a humiliation for a former imperial power working to rebuild its economy after World War II and the nadir of the post-war economic period, this in itself led to only a narrow lead for Margaret Thatcher's party in October 1978 in opinion polls. Strikes by essential services dismayed many senior ministers in the Labour government who had been close to the trade union movement, who had thought it unlikely that trade unionists would take such action. Among these was Prime Minister James Callaghan himself, who had built his political career on his connection to the trade unions, and had practically founded one, the Inland Revenue Staff Federation. The government was negotiating with the senior union leaders and on 11 February came to agreement on a proposal to be put to the TUC General Council. On 14 February the General Council agreed the concordat, published under the title "The Economy, the Government, and Trade Union Responsibilities". [n 4] By this stage union executives had limited control over their members and strikes did not immediately cease, although they began to wind down from this point. In total in 1979, 29,474,000 working days were lost in industrial disputes, compared with 9,306,000 in 1978. In the summer before the Winter of Discontent, the minority Labour government's fortunes in the opinion polls had been improving and suggested that they could gain an overall majority in the event of a general election being held. However, on 7 September 1978, Callaghan announced that no general election would be held that year. Callaghan's failure to call an election would ultimately prove to be a costly mistake for his government. The strikes appeared to have a profound effect on voting intention. According to Gallup, Labour had a lead of 5 percentage points over the Conservatives in November 1978, which turned to a Conservative lead of 7.5 percentage points in January 1979, and of 20 percentage points in February. On 1 March, referendums on devolution to Scotland and Wales were held. That in Wales went strongly against devolution; that in Scotland produced a small majority in favour which did not reach the threshold set by Parliament of 40% of the electorate. The government's decision not to press ahead with devolution immediately led the Scottish National Party to withdraw support from the government and on 28 March in a motion of no confidence the government lost by one vote, precipitating a general election. Conservative Party leader Margaret Thatcher had already outlined her proposals for restricting trade union power in a party political broadcast on 17 January in the middle of the lorry drivers' strike. During the election campaign the Conservative Party made extensive use of the disruption caused during the strike. One broadcast on 23 April began with the Sun's headline "Crisis? What Crisis?" being shown and read out by an increasingly desperate voiceover interspersed with film footage of piles of rubbish, closed factories, picketed hospitals and locked graveyards. The scale of the Conservatives' victory in the general election has often been ascribed to the effect of the strikes, as well as their "Labour Isn't Working" campaign, and the party used film of the events of the winter in election campaigns for years to come. Following Thatcher's election win, she brought the post-war consensus to a halt and made drastic changes to trade union laws (most notably the regulation that unions had to hold a ballot among members before calling strikes) and as a result strikes were at their lowest level for 30 years by the time of the 1983 general election, which the Conservatives won by a landslide. ^ The Three-Day Week was the Heath government's reaction to the coal miners' work-to-rule and strikes in 1974, that had a similarly disastrous impact on the government's popularity and led to the period of Labour government in the intervening years until 1979. ^ Colin Hay, "The winter of discontent thirty years on." The Political Quarterly 80:4 (2009): 545–52. ^ Unreliable sources: how the 20th…. Google Books. Retrieved 2 December 2010. ^ Popular newspapers, the Labour Party…. Google Books. Retrieved 2 December 2010. ^ Hamilton, Fiona. "Weather Eye: the Winter of Discontent 1978". The Times Online. London. Retrieved 2 December 2010. ^ Beckett, Andy (2010). When the Lights Went Out: Britain in the Seventies. Faber & Faber. p. 175. ISBN 978-0-571-22137-0. ^ Hay, "The winter of discontent thirty years on." ^ Labour Party (1978). Report of the Annual Conference. Labour Representation Committee. p. 235. ^ Moore (2014), p. 399. ^ a b Travis, Alan (30 December 2009). "National archives: Fear of fights at cemetery gates during 1979 winter of discontent". The Guardian. ^ James Thomas, '"Bound by History": The Winter of Discontent in British Politics 1979–2004', Media, Culture and Society, 29 (2007), p. 270. ^ a b "1978: Callaghan accused of running scared". BBC News. 7 September 1978. ^ "Conservative Party Election Broadcast (1983)". YouTube. 23 October 2008. Retrieved 2012-03-28. Hay, Colin. "The winter of discontent thirty years on." The Political Quarterly 80.4 (2009): 545–52. Rodgers, William. "Government under Stress: Britain's Winter of Discontent 1979." The Political Quarterly 55#2 (1984): 171–79. Shepherd, John (2013). Crisis? What Crisis? : The Callaghan Government and the British Winter of Discontent. Manchester: Manchester University Press. ISBN 9780719082474. Thomas, James. "‘Bound in by history’: The Winter of Discontent in British politics, 1979–2004." Media, Culture & Society 29#2 (2007): 263–83.